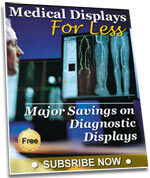 This 5 megapixel, high-brightness color monitor has the high-definition display necessary for breast imaging. It combines ease-of-use, such as a narrow bezel design to help your eyes swiftly move from one monitor to another, with new functions to help you focus on your work and maintain high performance. The monitor bezel is just 7.5 mm – the world's narrowest bezel on a 5 megapixel monitor; making the total distance between the visible screens of the two monitors only 15 mm. Furthermore, the bezel sits only 2.5 mm above the screen, making an almost completely flush bezel to easily switch your view between screens. The dimensions of the RX560 MammoDuo are reduced by 67 mm horizontally, 36 mm vertically, and 20.5 mm in depth compared to a conventional side-by-side configuration with a single monitor of the same total resolution. The total space occupied by the monitors was reduced by 22%, creating a more unrestricted environment with expanded viewing space. With the newly designed stand, you can adjust the height, tilt, and swivel of the two monitors without any gaps appearing between them. As more image modalities become digitalized, radiologists are viewing an increasing amount of information on their screens. EIZO's unique Work-and-Flow technology alleviates the complexity of the imaging workflow with new functions developed with the radiologist in mind. Users can take advantage of Work-and-Flow features with the RadiForce monitor and bundled RadiCS LE software. With the Point-and-Focus function, you can quickly select and focus areas of your concern with just your mouse and keyboard. Change the brightness and grayscale tones of certain points on the screen to make interpretation easier. Breast cancer screenings are increasingly combining the use of mammography and ultrasound to view patients with high breast density. Furthermore, if breast cancer is suspected, various other tests may also be needed such as biopsy, breast MRI and CT. The RX560 is the world's first medical monitor to use low temperature polysilicon (LTPS) liquid crystal display. Because of this, the color monitor can reach a brightness of up to 1100 cd/m2, similar to that of monochrome monitors. Due to this high brightness, the RX560 can display high-definition monochrome breast tomosynthesis and mammography images with deep blacks and no washout in addition to color images such as ultrasound and pathology. The monitor has obtained FDA 510(k) clearance by the U.S. Food and Drug Administration for breast tomosynthesis and mammography. This ensures that the monitor is capable of displaying detailed breast screening images where high performance is essential. Hybrid Gamma PXLThe Hybrid Gamma PXL function automatically distinguishes between monochrome and color images pixel by pixel, creating a hybrid display where each pixel has optimum grayscale; giving it greater accuracy and reliability than the conventional area-detection method. In addition to breast tomosynthesis and mammography monochrome images, which require high display performance, the RX560 also faithfully reproduces color images such as breast MRI and CT, ultrasound, and pathology. This ultimately improves efficiency by allowing both monochrome and color images to be viewed on one screen. EIZO, in collaboration with the Federation of National Public Service Personnel Mutual Aid Association of Kumamoto Chuo Hospital, Japan, conducted a visual assessment of the function. As a result of comparing monitors with the function turned on and off, it was found that Hybrid Gamma PXL accurately displays monochrome images according to DICOM Part 14, and actually improved accuracy of color image interpretation. 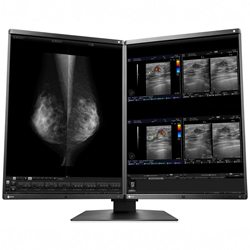 The monitor has a response time of 12 milliseconds, making it ideal for enlarging and panning medical images, as well as quickly displaying 3D breast tomosynthesis which comprises of several images in each shot. The monitor is equipped with DisplayPort 1.2 input and output terminals. Using the output terminal allows you to easily configure several monitors in a daisy chain sequence without the hassle of excessive cabling. EIZO offers anti-glare (AG) and anti-reflection (AR) screen variations to suit user environments. AG treatment is ideal for exceptionally bright environments and drastically reduces glare from ambient lighting. AR treatment is ideal for moderately-lit environments to reduce mild screen glare while maintaining crisp text and images. MTF measures numerically how faithfully the panel transfers detail from the original image data for viewing. When Sharpness Recovery is turned on, in the case of a 2 pixel line pair (spatial frequency of 1.515 cycles/mm) the MTF increases by approximately 45%. The monitor hosts 0.165 mm pixels, realizing a smooth, high-density, high-definition image without graininess. The monitor hosts an Integrated Front Sensor (IFS). It is built into the bezel and is only visible when in use; not needing any time to set up. By using it together with the included monitor control software RadiCS LE, brightness and gradation can be corrected to match DICOM Part 14 standards. The monitor supports 10-bit input for each RGB color, displaying more than one billion colors simultaneously. This ensures accurate color reproduction for images such as MRI, ultrasound, and pathology. The CAL Switch function allows you to choose various modes for different modalities, such as mammography and breast MRI, ultrasound, and pathology, without the need to calibrate each time. Using the bundled RadiCS LE software, modes can be set to automatically switch to optimal image viewing conditions with the click of a mouse or using the monitor's display mode. EIZO's highly versatile stand offers tilt, swivel, and a wide height adjustment range, enabling you to use the monitor with greater comfort. EIZO's easy-to-use RadiCS UX2 quality control software & calibration sensor (sold separately) performs precise calibration conforming to DICOM Part 14 and enables quality control (QC) complying with ACR Practice Guideline and other QC standard for digital mammography monitors. Size	54.1 cm / 21.3"